This year, Maison Leroy is releasing a handful of their 1964s. Over the decades, Leroy has amassed a collection of pristine, older wines that is simply incomprehensible by today’s standards in Burgundy. “I am not sure why people are in such a rush today,” says Bize-Leroy looking at her 1964s. “Wines need time. These bottles are only now truly ready to drink.” Bize-Leroy’s two beloved dogs are never far away as we move into the three 1964s she has chosen. The 1964 Meursault Les Genevrières is simply one of the most monumental wines I have ever tasted. A deep, honeyed amber, the 1964 emerges from the glass with an intoxicating mélange of slate, silex, honey, mint, orange marmalade and spices. The interplay of the classic Genevrières minerality and the more viscous, honeyed notes that have developed in the glass results in a never-ending array of aromas, flavors and textures that are almost overwhelming for their intensity and sheer profoundness. At 50 years of age, the 1964 isn’t going anywhere. It may very well continue to drink well for another few decades. In case, readers are wondering, many of the other greatest whites I have ever tasted are from Madame’s Domaine d’Auvenay. I come back to the Genevrières several times during this tasting and never find it to be anything less than viscerally thrilling. 98/Drinking window: 2014-2034. 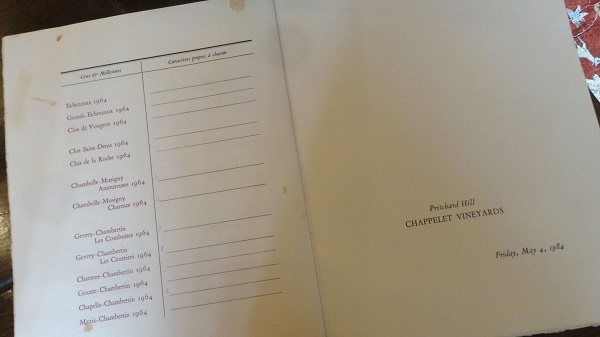 This tasting book commemorates a 20th anniversary tasting of the 1964s held at Chappellet in Napa Valley. The full selection of 1964s in that tasting ran three pages long. The 1964 Corton-Renardes has held up very well, but it has arrived at a plateau of maturity where it may hold for some time, although I don’t see much further potential for improvement from here on out. 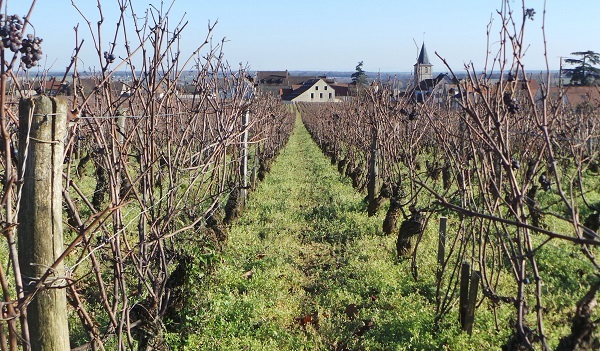 A distinctly earthy wine, the Corton-Renardes is very much tied to the ground. Sweet tobacco, cedar, game and red stone fruits inform the deep, virile finish. 95/Drinking window: 2014. 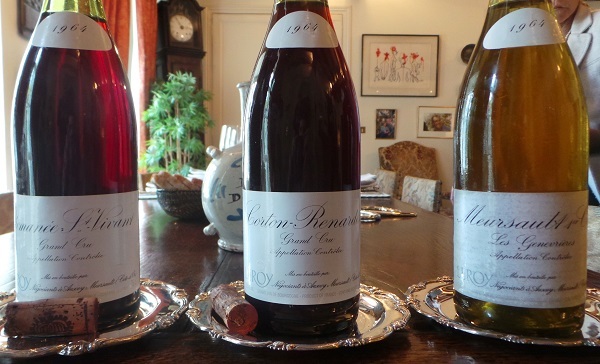 If Leroy’s Corton-Renardes is an earthy wine, the 1964 Romanée St. Vivant is celestial. Increasingly beautiful and nuanced with each taste, the RSV captivates all the senses with its exhilarating perfume, silky texture and breathtaking overall balance. Sweet floral notes meld into hard candy, rose petals, star anise, mint and spices in a silky, utterly exquisite Burgundy of the highest level. Fresh, vibrant and impeccable, especially for a wine of its age, the 1964 is going to have something to say for a number of years. In a word: magnificent! 97/Drinking window: 2014-2024. Our tasting ends with the Fine de Bourgogne, which is soft and inviting to the core. Gentle apricot pit, almond and warm, smoky notes caress the palate in an incredibly inviting, sensual Fine that is impossible to resist. There is not a hard edge in sight. “My father told me the Fine was 40-50 years old when we first released it in 1968, so now it is close to 100 years old,” says Bize-Leroy. “It took us a little while to find the right bottle, but we will be moving the Fine out of demijohn and bottling it later this year.” Readers who can source the Fine should not hesitate. 97/Drinking window: 2014+. With that, the tasting is over, but the memories, well, they will last forever.